Irish Setter. Photography by DragoNika / Shutterstock. When you bring an Irish Setter into your home, prepare for a downright giddy housemate. Full of boisterous energy and love, Irish Setters will want to be involved in everything you do. They love family time, whether indoors or out, and they get along famously with children. Irish Setters form strong bonds with their owners, but they are gentle and welcoming with just about everybody—other pets included. Aside from a good, healthy bark, they don’t have any solid “watchdog skills.” Strangers who drop by the house will most likely be wrangled into a lengthy game of fetch. Bred for hunting in the fields, Irish Setters are bursting with energy, quickness and endurance. If you’re a jogger, runner or bicyclist, take them along. 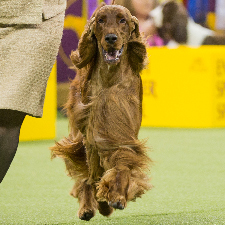 Irish Setters will be calm, happy and trainable as long as they have an outlet for this exuberant energy. 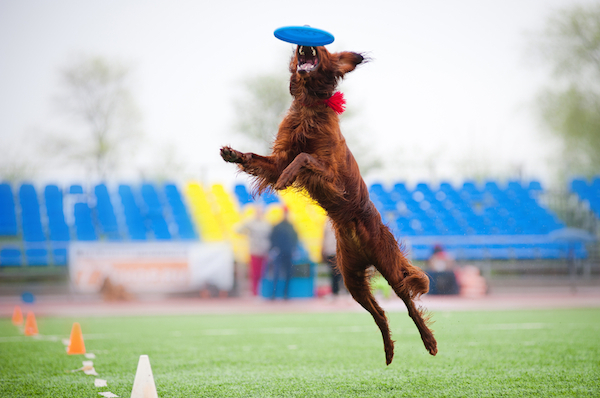 An Irish Setter catching a flying disc during competition. Photography by Ksenia Raykova / Shutterstock. 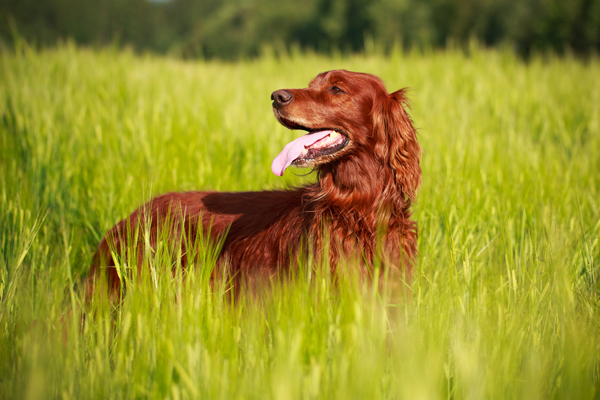 Irish Setters can live as long as 15 years. Common health issues can include hip dysplasia, skin allergies, eye problems and epilepsy. Also, observe portion control when it comes to feeding: Irish Setters are prone to bloat. Feeding them smaller meals throughout the day is a good practice. Irish Setters were developed from a mix of Irish Terrier, Irish Water Spaniel and English Setter—among other breeds—to be the ideal birding dog. For hundreds of years, they were categorized with a large group of red and white setters. In the early 1800s, the solid-red Irish setter became the commonly accepted type, though some of these red dogs still carried patches of white. With the instincts of a great hunter, the beauty of a show dog and the winning personality of a family pet, the Irish Setter is one of the world’s most beloved dogs.